This book provides an innovative examination of the European Union as it departs from its path of integration. Indeed, so far has it departed that it could be described as having entered a new reality. The original reality was that captured in the evocative phrase in its founding agreement, the Treaty of Rome, that it should be an ever-closer union of peoples. Largely that was the path followed until the 1990s, but by the early twenty-first century there have been signs that it is turning into an ordinary international organization in which there is little overriding sense of purpose. This book discusses the indications of this development and explains why it happened only a decade or so after a peak of popular enthusiasm in the early 1990s. The question was whether the EU would become less important for the member states, as seemed to be the case for the British, or whether the German pattern, in which the EU remained important, would prevail. 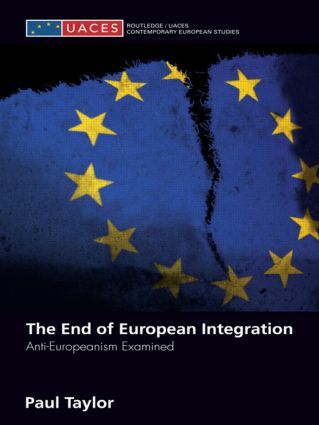 This book concludes that the former is more likely in part because of problems with the policies of the European Union and its conduct, but more specifically because of the current prevailing political culture in Western Europe. Paul Taylor warns that the current problems are underestimated and that there is the risk of casually throwing away the considerable achievements of the integration process. The End of European Integration will be of interest to all those with an interest in European integration, whether for or against. It will also interest students of European studies, European politics, and politics and international relations in general. Integration theory in the early twenty-first century: a setting for disintegration?